Call the Alaska Section of Epidemiology at 907-269-8000 (Mon-Fri 8 am-5 pm) or 1-800-478-0084 (after hours). If one case occurs, there will likely be others and reporting even mild cases can save others from becoming ill and may save lives! Reporting cases helps with forecasting toxic blooms and issuing public health notices about the possibility of toxic shellfish. Scroll to the bottom of this page to learn how to spot symptoms of toxic algae poisoning. Marine algae range from single-celled phytoplankton to giant kelp. The tiniest and simplest are extremely abundant in the ocean and serve as the base of the aquatic food chain. When the ocean temperature, nutrients and light line up in a certain way, phytoplankton start to bloom, meaning they reproduce very rapidly. These blooms are key to supporting populations of commercially important fish, birds and mammals. However, some marine phytoplankton produce toxins that, when concentrated in tissues of filter-feeding bivalves like clams, oysters and mussels, can poison wildlife and humans. Algal blooms that produce vast quantities of harmful algae are called harmful algal blooms or HABs. HABs have killed 15 people in Alaska in the last eight decades, sickened hundreds, and imposed serious financial consequences on the seafood industry. In recent years conditions that trigger HABs are occurring more frequently. Why are these blooms becoming more common? Higher water temperatures, a result of increasing atmospheric temperatures. Introduction and transport of toxins in carrier species. For example, the highest concentrations of domoic acid have been found in anchovies, which migrate into Alaska waters in warm years. A warming global climate raises ocean temperatures, changes the speed and trajectories of ocean currents, changes water chemistry, and increases water salinity and temperature stability, all of which promote algal blooms. The Alaska Department of Health and Social Services' Division of Public Health has said climate change is likely to increase the threat of harmful algal blooms. 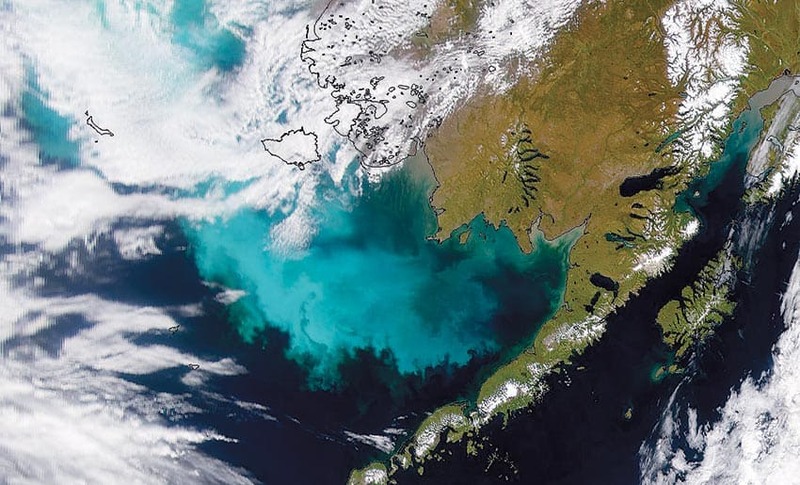 Warmer waters extend the phytoplankton growing season, increasing the likelihood of toxic blooms, and may allow new potentially harmful phytoplankton species to expand their ranges to Alaska. In late 2016 a network of experts from across the state was formed. The Alaska Harmful Algal Bloom Network works to help Alaska communities better understand and mitigate the effects of harmful blooms of algae, including the toxins they produce and the potential health risks to humans and animals. Partners in the AHAB Network aim to improve public awareness, research, monitoring and responses statewide. The AHAB Network website provides information from regional groups with explanations of the various research and monitoring efforts around the state. The website also offers news, resources and information. It features a video on how bloom toxins get into food and how members of the public can protect themselves. 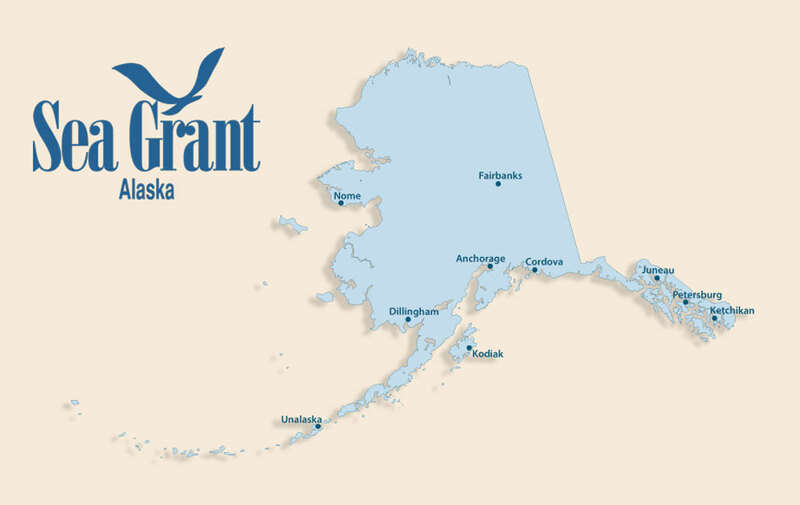 The network is coordinated jointly by the Alaska Ocean Observing System and Alaska Sea Grant. Harmful algal blooms affect Alaskans in two ways: they threaten health, and they impose sig­nificant financial costs. When these blooms occur, toxins can concentrate in tissues of shellfish eaten by humans and wildlife. These toxins can cause paralytic shellfish poisoning (PSP) which can be fatal in humans. Paralytic shellfish poisoning occurs in potentially fatal concentrations on many parts of the Alaska coast each year. The existence of PSP imposes significant testing and monitoring costs on the commercial shellfish industry, and restricts species, areas and times of harvest. Shellfish growers have to site their farms to avoid areas where blooms are more likely, and in some cases have to relocate grow-out gear to avoid contamination. Recreational and personal-use harvesting is limited, which decreases tourism opportunities. Non-toxic algal blooms can cause problems as well. Some village water systems now require several intake filter changes per day during the summer due to clogging by algal blooms, at considerable cost. Some villages have had to relocate water system intakes or change sources of village water altogether, a very expensive undertaking. Shellfish are harvested along Alaska’s many beaches for subsistence and recreational purposes throughout the year. Before collecting and consuming shellfish in Alaska you should be aware of the risks. Paralytic shellfish poisoning, or PSP, is a serious illness caused from eating shellfish contaminated with toxins from algae. Subsistence and recreationally harvested shellfish, including clams, mussels, oysters, geoducks, scallops, predatory snails, and crab, can contain PSP toxins. If ingested in high enough concentrations, PSP toxins can cause serious illness in humans and can even result in death. No beaches in Alaska are certified as “safe” for recreational and subsistence shellfish harvesting and there is no known antidote for PSP. Paralytic shellfish poisoning (PSP) is a serious illness that is caused by eating shellfish that have been feeding on microscopic, single-celled dinoflagellate algae (Alexandrium in Alaska) that produce highly poisonous toxins. These PSP toxins, commonly referred to as saxitoxins, are neurotoxins that block the movement of sodium through nerve cell membranes, stopping the flow of nerve impulses. Without the movement of sodium, nerve cells cannot function, causing the PSP symptoms of tingling, numbness, disorientation, paralysis, nausea, respiratory failure, and even death. PSP toxins are estimated to be 1,000 times more toxic than cyanide, and as little as 1 milligram of saxitoxin is enough to kill an adult human. Eating a single shellfish, such as a clam, that is contaminated with PSP toxin has the potential to cause death. Symptoms can start quickly, within minutes of consuming contaminated shellfish, or they may not appear until hours after consumption. The median time between consuming the shellfish and onset of symptoms is one hour. The progression and intensity of the symptoms vary among individuals and are influenced by the level of toxin present and the amount of shellfish consumed. The first symptom to appear is usually tingling and numbness in the mouth region. In severe cases the muscles of the chest and abdomen can become paralyzed, and if breathing assistance is not provided, respiratory failure can occur. Death can occur within two hours of consuming infected shellfish. There is no antidote for PSP. In general, supportive measures are the only means of treatment, specifically breathing and cardiac support in severe cases. If you or someone else exhibits PSP symptoms, get medical help immediately. It is highly recommended that a medical assessment be made as soon as possible after symptoms appear. Symptoms can become more severe over time, and because the amount of PSP toxins consumed is often unknown, progression of the illness is unpredictable. If the level of toxin is high enough to cause respiratory paralysis, the victim will need to be put on a mechanical respirator and given oxygen to help with breathing. Symptoms can resolve completely within hours to days after consuming infected shellfish. Paralytic shellfish poisoning is a public health emergency. If one case occurs, there will likely be others and reporting even mild cases may save another person’s life. Health care providers and citizens should report any suspected case of PSP immediately to the Alaska Section of Epidemiology. To report, call 907-269-8000 (Monday–Friday, 8 am–5 pm) or 1-800-478-0084 (after hours). Several species of diatoms (phytoplankton algae) in the genus Pseudo-nitzschia produce the neurotoxin domoic acid, which causes a condition called amnesic shellfish poisoning (ASP) in humans. When shellfish and plankton-eating fish such as herring, capelin, and sand lance consume the diatoms, domoic acid can accumulate to very high levels without negatively affecting the fish. The toxins can be passed up the food chain to fish, birds, marine mammals, and humans that consume the shellfish and fish, causing illness and sometimes death. Domoic acid has been responsible for the deaths of hundreds of California sea lions, and the cause of reproductive failure in many others. It appears almost yearly along the California coast. Domoic acid poisonings in history have been rare or undocumented. No cases of ASP in humans have been reported in Alaska, but domoic acid has been responsible for illness in more than 100 people in North America and several deaths. Domoic acid–producing species are present in Alaska, however, and environmental changes that support algal blooms could increase their abundance and range in Alaska. There is no antidote for ASP and treatment is supportive only. The potency of ASP toxins appears to be less than for PSP, but if ASP toxins are ingested in high enough concentrations they can be very dangerous and have been known to cause death in several people. Seek medical attention if you exhibit any symptoms of ASP after consuming shellfish. Report any cases of suspected and confirmed amnesic shellfish poisoning! If one case occurs, there will likely be others and reporting even mild cases may save another person’s life. Health care providers and citizens should report any suspected case of ASP immediately to the Alaska Section of Epidemiology. To report, call 907-269-8000 (Mon-Fri 8 am-5 pm) or 1-800-478-0084 (after hours). Any organism that consumes the algae species that contain domoic acid, and organisms that consume those organisms, can pose a risk to humans. 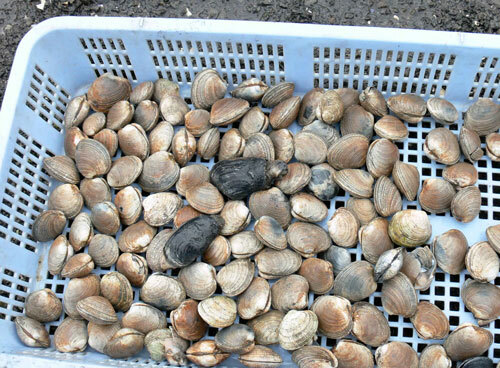 All recreation and subsistence harvested bivalve shellfish, including mussels, clams, geoducks, oysters, and scallops, can contain domoic acid. Crab meat is not known to contain domoic acid, but their guts can contain the toxin from feeding on contaminated shellfish. Before cooking, remove the back shell of the crab and take out the dark soft tissue that makes up the digestive system and crab butter (hepatopancreas). Marine mammals in Alaska have been shown to contain low levels of domoic acid. In other regions of the United States, such as California, domoic acid poisoning has killed many marine mammals. It is unknown whether marine mammals can acquire high enough levels of domoic acid in their tissues to pose a risk to humans who consume them. To date, no case of ASP has been reported in Alaska from consuming marine mammals. As domoic acid becomes more prevalent it is important to remain aware of the risk and know the symptoms of ASP. Both domoic acid and PSP toxins can accumulate in shellfish in Alaska, and recreational beaches are not tested for these toxins. Cooking or freezing shellfish does not destroy the toxins. It is best not to consume recreational and subsistence collected shellfish. Commercially bought bivalves (clams, mussels, and scallops) are tested for toxins, and are safe to consume. Crabs can also accumulate toxins in their digestive systems, but they are not regularly tested for algal toxins. It is recommended that you clean your crabs, removing the guts and crab butter, before cooking. Dinophysis is a dinoflagellate alga that produces multiple neurotoxins including dinophysistoxins and okadaic acid. Shellfish consume the toxic algae and can retain the toxins in their tissues. When humans consume shellfish that have accumulated toxins, they can become ill. In humans, the illness is called diarrhetic shellfish poisoning (DSP). DSP has not been documented in Alaska, but it is an emerging health threat in Washington and has been documented in Canada. In summer 2011, the first confirmed DSP illnesses were documented in Washington in three people who had consumed recreationally harvested mussels. DSP may become a threat for Alaska in the future. There have been no deaths reported from DSP. A full recovery typically occurs within 3 days of exposure, with or without medical treatment. For mild symptoms, call your health care provider. If symptoms are severe call 911 or have someone take you to the hospital immediately. Treatment usually involves replacing fluids and electrolytes lost during the illness. Generally, hospitalization is not needed and fluids can be replaced orally. Report any cases of suspected and confirmed diarrhetic shellfish poisoning! DSP has not been reported in Alaska to date, but it may occur in the future. If one case occurs, there will likely be others and reporting even mild cases can be very helpful in preventing illness in others. Health care providers and citizens should report any suspected case of DSP immediately to the Alaska Section of Epidemiology. To report, call 907-269-8000 (Mon–Fri 8 am–5 pm) or 1-800-478-0084 (after hours). Any organism that consumes the algae species that contain DSP toxins, and organisms that consume those organisms, can pose a risk to humans. DSP is usually reported from consuming contaminated bivalve shellfish, including clams, mussels, oysters, geoducks, and scallops. Many types of algal toxins can accumulate in shellfish in Alaska, including domoic acid (amnesic shellfish poisoning), paralytic shellfish poisoning toxins, and possibly DSP toxins. Recreational beaches are not tested for these toxins. Cooking or freezing shellfish does not destroy the toxins. It is best not to consume recreational and subsistence collected shellfish. Commercially bought bivalves (clams, mussels, and scallops) are tested for toxins, and are safe to consume. Crabs can also accumulate toxins in their digestive systems, but are not regularly tested for algal toxins. It is recommended that you clean your crabs, removing the guts and crab butter (hepatopancreas), before cooking. Cyanobacteria, commonly called blue-green algae, are found in fresh, brackish, and marine waters. Cyanobacteria blooms typically form in warm, slow-moving waters that are high in nutrients such as nitrogen and phosphorus. The bloom can appear as foam, scum, or mats on the surface that are several inches thick. The color of the bloom can vary from no color change to blue, bright green, brown, and red. Some species of cyanobacteria produce cyanotoxins, which are harmful to both wildlife and humans. It is not possible to determine if a bloom is toxic by just looking at it. Symptoms: Cyanotoxins can cause skin irritations, damage to the liver, gastrointestinal symptoms, neurological symptoms, and even death, depending on the species of cyanobacteria. The blooms of greatest concern occur in fresh waters, such as drinking water reservoirs or recreational waters. Cyanobacteria blooms can pose a risk to humans through exposure to contaminated freshwater via recreational activities on the water, and the consumption of contaminated drinking water, fish, and shellfish. Large blooms may also deplete the oxygen levels in water and can cause death among local populations of plants and animals.